At long last, the Ford Ranger Raptor has been launched in Malaysia, just under a month after the standard Ranger range was introduced. The high-performance pick-up truck comes with an uprated Baja-ready chassis and is powered by a new engine also found on the range-topping Wildtrack 4×4. Priced at RM199,888 on-the-road without insurance, the Raptor comes to our shores even cheaper than in the country it is built, Thailand, where it retails at 1.699 million baht (RM215,800). Included in the price is a three-year/100,000 km warranty. At its heart is the latest 2.0 litre EcoBlue twin-turbocharged four-cylinder diesel engine from the Panther family, punching out 213 PS and 500 Nm of torque. All this is routed through a Getrag 10R80 10-speed automatic transmission with a wider ratio span that improves acceleration and responsiveness. Under the blistered rammed-its-way-through-Brother’s bodywork, the chassis has been reinforced with high-strength low-alloy (HSLA) steel and features wider front and rear tracks, greater approach and departure angles and an increased water wading depth of 850 mm. There’s also a coil-sprung solid rear axle with a Watt’s linkage to control body movements. Then there’s the signature Raptor party piece – Fox Racing Shox dampers just like on the F-150 Raptor, with Position Sensitive Damping (PSD) offering high damping forces for going off-road at full pelt, and lower forces in the mid-travel zone for more comfortable tarmac driving. Also fitted are 17-inch black six-spoke alloy wheels wrapped in 33-inch BFGoodrich all-terrain tyres, as well as uprated brakes. 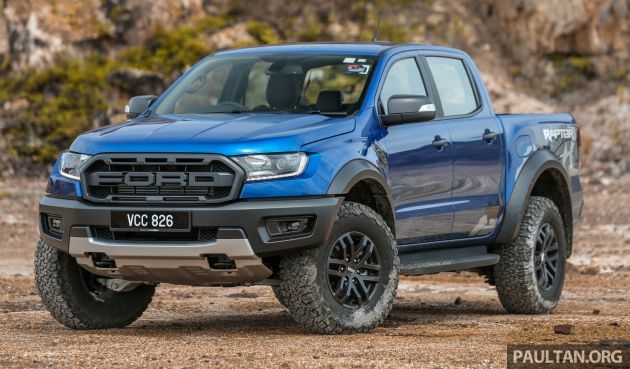 On the outside, the Ranger Raptor has been beefed up, with the most significant change being the Ford block letter grille that has already been seen on plenty a Ranger over here. There are also durable composite fender flares to house the wider tyres, along with a sturdy frame-mounted front bumper, a steel bash plate, front and rear skid plates, alloy side steps, an integrated rear tow bar and tow hooks rated at 3.8 tonnes. Just two exterior colour options are available – the hero Lightning Blue and Conquer Grey. Inside, there are part-leather sports seats with blue stitching and embroidered Raptor logos, a sportier steering wheel with magnesium paddle shifters and a unique instrument cluster. Standard kit includes xenon headlights with LED daytime running lights, LED fog lights, keyless entry, push-button start, auto lights and wipers, an auto-dimming rear-view mirror, cruise control, an eight-way powered driver’s seat, active noise cancellation, dual-zone auto climate control, a rear 230-volt power socket and a SYNC 3 infotainment system with an eight-inch touchscreen and Apple CarPlay and Android Auto. Safety-wise, the Raptor comes with six airbags, ABS with EBD and brake assist, stability control, hill descent control and rear ISOFIX child seat anchors. 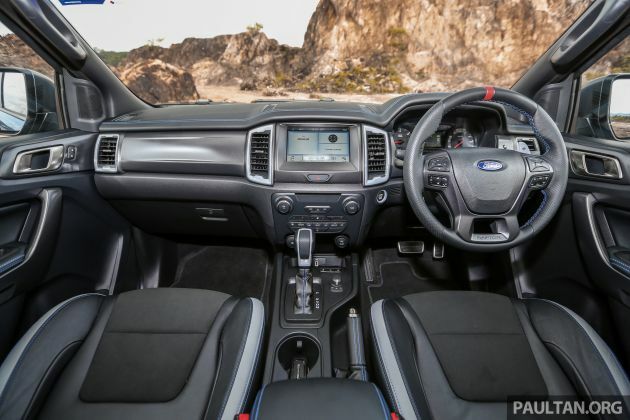 However, it doesn’t get the Wildtrak 4×4’s driver assists, which include autonomous emergency braking, lane keeping assist and adaptive cruise control. Not quite accurate. Trucks with coil springs in Thailand are taxed as a saloon car thus the higher price. The new king of trucks!!! Ford Malaysia should also brought in other two clolours-Black Stallion & Race Red like in Thailand. The two colours available are striking. Ford Malaysia should also brought in other two colours-Black Stallion & Race Red like in Thailand. The two colours available are not striking. Alamak Wildtrak has some kit that the Raptor doesn’t…..
For all the Ah Bengs and Abangs in Malaysia too who cant afford a FK8 Type R? Buy this monster and perform drag races, burnouts and the best part is you guys can even survive through different weather conditions and not worry about silly scratches compared to the Type R racer. LMFAO. Am I right @HafrizShah and @JonathanLee and the boss @Paultan? Scratches, Yes. Higher ground clearance too. This ASEAN Raptor is a hell of a lot tougher than the Type R and the Hideous and outdated HRV. LOL. Its like a vehicle to take into a zombie apocalypse. this raptor is equipped with a weakling 2000cc engine . burnouts ? in your dreams man. a myvi 1.5 will outrun this raptor in both 0-100 acceleration and top speed. WTH did I just saw??? RM200k?? Kudos to SDAC for bringing this in – finally. It’s been a long wait. However, reading online reviews on the new 2.0L Panther unit reveals mixed views. It has low end grunt, but seeing the Raptor is significantly heavier, the 2.0L is a little lacklusture at the top end. Max speed is quoted at 170 km/h, and 0-100 = 10.4 secs. 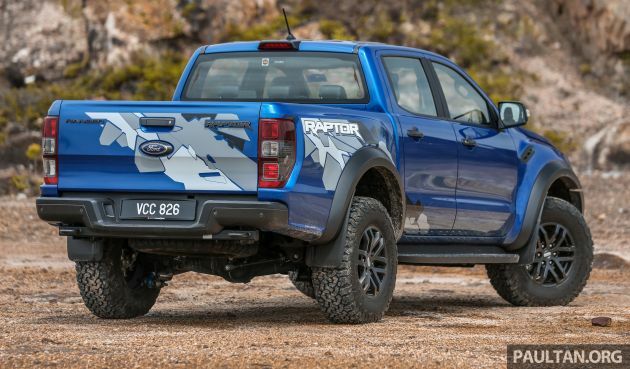 The Raptor supposedly beats the (current) Wildtrak’s time of 11 secs. Unknown is how fast is the latest Wildtrak with the 2.0L EcoBlue engine vs the Raptor. Should be somewhat faster, as the Wildtrak is significantly lighter vs the Raptor. Maximum towing weight drops to 2500kg (from 3500kg in the Ranger) and payload to 758kg (from 961kg). I’d like to compliment the Paul Tan team on superb quality pictures taken of the Raptor. Excellent photography, lighting and composure, using Mother Nature blurred into the background/foreground. Well done – beautiful pictures. This truck deserves nothing less. Are you rich or offroad often ? Are you clever enough to save $60k and have better safety features unavailable even on the ranger raptor? If f150 sell here people will buy too. 200k for this sissy nonsense! 200k is pretty fair for the performance that it offers…. Too bad the Raptor doesn’t come with the driver’s assist… So expensive yet lacking. Like most 4wd user, Ranger hardly will see the dirt/off road. Most user will use in town with occasional off road. The driver assist will really helps in everyday traffic. The significance of the ranger raptor cannot be underestimated. We are typically presented with a choice of cheap but dull vs expensive but fast. The likes of the raptor democratized that for the 4wd and brings the crazy fun closer to our market median. Like what 1st gen golf gti did to compact cars. In places like Sarawak with our rubbish roads, this car cud be affordable, handles like hell in all terrain and weather (which in some parts of this state still constitute daily commute) and yes, be a bit of rough fun for our ah Bengs. I hope sales does well enough here that other companies will innovate on the idea and make it even more affordable. That said, I owned a 2012 focus. Fix your bloody gears Ford. Is anyone here waiting for the new MITSUBISHI TRITON instead of this RAPTOR ? 200k for a Raptor is the greatest value I’ve seen in the Malaysian automaker in years, and yet I still see people complaining. Typical Malaysians. You can say it is worth to have this truck at rm200k. Many Malaysian afford this price and the number otr will tell u worth or not!